Cabachon pair of MATCHING COLORED, lovely luster, 2.25cts. Make a statement with these candy yellow colored natural Burmese sapphires. These sweet cabochons will surely impress you every time you see them with appealing color and lovely luster. These sapphires would be perfect for unique and attractive jewelry. Approximate dimensions are as follows: calibrated 5 mm length x 5 mm width x 3 mm deep and the other 6.5 mm length x 6.5 mm width x 3.5 mm deep and weight is 1.46 and .79 = 2.25ct. in total. 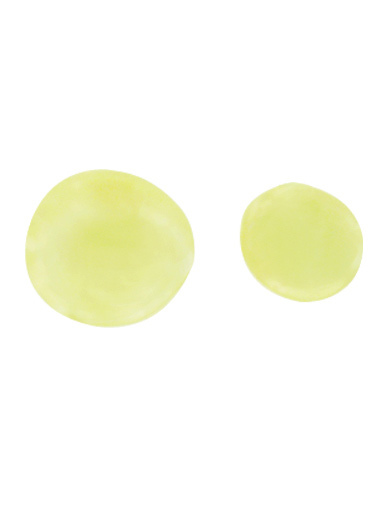 These cabochons come with a copy of an independent lab identification / origin report. Yellow sapphires are not as common as other colors from the legendary Mogok stone tract. Yellow sapphire is the birthstone for the month of September.